First of all thank you to the publisher for letting me review the book. With all honesty, I'm not sure how will I compose my book review, the book I think is very young adult and slow paced but I still read it. I guess that's a good choice I made. 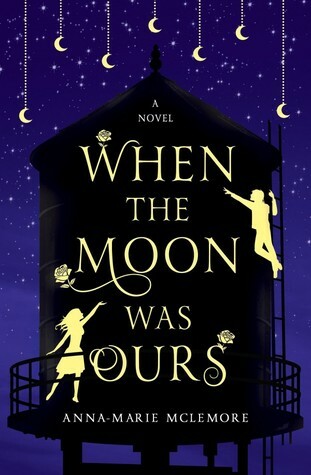 When The Moon Was Hours was a good book but I was struggling at first but as the story goes on, I began to love it. The book is fascinating and magical. I could say at first it is weird because of Miel growing roses on her wrist but I guess that's nice in some way. I liked the story between Miel and Sam, best friends and lovers at the same time. I love the cover of the book too. It is catchy and simple at the same time. I would like to get a physical copy of this book. I only have the e-galley though. I'll make my review short for now I'm out of words. As far as he knew, she had come from the water. But even about that, he couldn’t be sure. It didn’t matter how many nights they’d met on the untitled land between their houses; the last farm didn’t rotate its crops, and stripped the soil until nothing but wild grasses would grow. It didn’t matter how many stories he and Miel had told each other when they could not sleep, him passing on his mother’s fables of moon bears that aided lost travelers, Miel making up tales about his moon lamps falling in love with stars. Sam didn’t know any more than anyone else about where she’d come from before he found her in the brush ﬁeld. She seemed to have been made of water one minute and the next, became a girl. Someday, he and Miel would be nothing but a fairy tale. When they were gone from this town, no one would remember the exact brown of Miel’s eyes, or the way she spiced recado rojo with cloves, or even that Sam and his mother were Pakistani. At best, they would remember a dark-e yed girl, and a boy whose family had come from somewhere else. They would remember only that Miel and Sam had been called Honey and Moon, a girl and a boy woven into the folklore of this place. This is the story that mothers would tell their children: T here was once a very old water tower. Rust had turned its metal such a deep orange that the whole tank looked like a pumpkin, an enormous copy of the fruit that grew in the ﬁelds where it cast its shadow. No one tended this water tower anymore, not since a few strikes from a summer of lightning storms left it leaning to one side as though it w ere tired and slouching. Years ago, they had ﬁlled it from the river, but now rust and minerals choked the pipes. When they opened the valve at the base of the tower, nothing more than a few drops trickled out. The bolts and sheeting looked weak enough that one autumn windstorm might crumble the whole thing. So the town decided that they would build a new water tower, and that the old one would come down. But the only way to drain it would be to tip it over like a cup. They would have to be ready for the whole tower to crash to the ground, all that rusted metal, those thousands of gallons of dirty, rushing water spilling out over the land. For the fall, they chose the side of the tower where a ﬁeld of brush was so dry, a single spark would catch and light it all. All that water, they thought, might bring a little green. From that ﬁeld, they dug up wild ﬂowers, chicory and Indian paintbrush and larkspur, replanting them alongside the road, so they would not be drowned or smashed. They feared that if they w ere not kind to the beautiful things that grew wild, their own farms would wither and die. Children ran through the brush ﬁelds, chasing away squirrels and young deer so that when the water tower came down, they would not be crushed. Among these children was a boy called Moon because he was always painting lunar seas and shadows onto glass and paper and anything he could make glow. Moon knew to keep his steps and his voice gentle, so he would not startle the rabbits, but would stir them to bound back toward their burrows. When the animals and the wild ﬂowers were gone from the brush ﬁeld, the men of the town took their axes and hammers and mallets to the base of the water tower, until it fell like a tree. It arced toward the ground, its fall slow, as though it were leaning forward to touch its own shadow. When it hit, the rusted top broke off, and all that water rushed out. For a minute the water, brown as a forgotten cup of tea, hid the brush that looked like pale wheat stubble. But when it slid and spread out over the ﬁeld, ﬂattening the brittle stalks, soaking into the dry ground, every one watching made out the shape of a small body. A girl huddled in the wet brush, her hair stuck to her face, her eyes wide and round as amber marbles. She had on a thin nightgown, which must have once been white, now stained cream by the water. But she covered herself with her arms, cowering like she was naked and looking at every one like they were all baring their teeth. At ﬁrst a few of the m others shrieked, wondering whose child had been left in the water tower’s path. But then they realized that they did not know this girl. She was not their daughter, or the daughter of any of the mothers in town. No one would come near her. The ring of t hose who had come to see the tower taken down widened a little more the longer they watched her. Each minute they put a little more space between her and them, more afraid of this small girl than of so much falling water and rusted metal. And she stared at them, seeming to meet all their eyes at once, her look both vicious and frightened. But the boy called Moon came forward and knelt in front of her. He took off his jacket and put it on her. Talked to her in a voice soft enough that no one else could hear it. Everyone drew back, expecting her to bite him or to slash her ﬁngernails across his face. But she looked at him, and listened to him, his words stripping the feral look out of her eyes. After that day, anyone who had not been at the water tower thought she was the same as any other child, little diff ere nt from the boy she was always with. But if they looked closely, they could see the hem of her skirt, always a little damp, never quite drying no matter how much the sun warmed it. This would be the story, a neat distillation of what had happened. It would weed out all the t hings that did not ﬁ t. It would not mention how Miel, soaking wet and smelling of rust, screamed into her hands with every one watching. Because every one was watching, and she wanted to soak into the ground like the spilled water and vanish. How Sam crouched in front of her saying, “Okay, okay,” keeping his words slow and level so she would know what he meant. You can stop screaming; I hear you, I understand. And because she believed him, that he heard her, and understood, she did stop. It would leave out the part about the Bonner sisters. The four of them, from eight-y ear-old Chloe to three-y ear-old Peyton, had been t here to see the water tower come down, all of them lined up so their hair looked like a forest of autumn trees. Peyton had been holding a small gray pumpkin that, in that light, looked almost blue. She had it cradled in one arm, and with the other hand was petting it like a bird. When she’d taken a step toward Miel, clutching that pumpkin, Miel’s screaming turned raw and broken, and Peyton startled back to her sisters. Once Sam knew about Miel’s fear of pumpkins, he understood, how Peyton treating it like it was alive made Miel afraid not only of Peyton but of all of them. But that part would never make it into the story. This version would also strip away the part about Sam trying to take Miel home like she was a stray cat. Anna-Marie McLemore was born in the foothills of the San Gabriel Mountains, raised in the same town as the world's largest wisteria vine, and taught by her family to hear la llorona in the Santa Ana winds. Her debut novel THE WEIGHT OF FEATHERS was a Junior Library Guild Selection, a YALSA Best Fiction for Young Adults book, and a finalist for the William C. Morris Debut Award. Her second novel, WHEN THE MOON WAS OURS, will be released on October 4, 2016, and WILD BEAUTY is forthcoming in 2017.